Apple’s updated Safari browser includes speed tweaks, a smooth story reader, and long-awaited browser extension support. Safari 5 installs quickly and with little fuss. Providing your e-mail for announcements and product pitches is optional, as is installing network discovery service Bonjour along with Safari. To test the new Reader feature, head towards your favorite news site and click a story. Look for the gray Reader button to the right of the URL in the address bar (where you'd usually see the RSS button). Click it, and you'll see the story in a clean, white-page overlay that includes just the story, with links and pics but no ads, navigation or other clutter. It's a nice way to read, with small pop-up controls at the bottom for zooming in or out, and e-mailing or printing the story. Typing in the address bar showcases Safari 5's new ability to search for what you type among your browsing history and bookmarks, with matches displayed in a drop-down below the address. 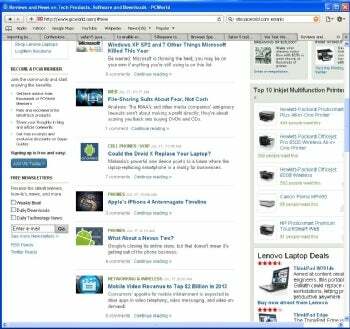 First introduced with Firefox 3's "Awesome bar," the seemingly small feature provides a big boost to your ability to quickly reach the sites you're after. Other changes include the addition of HTML5 support, the option of Bing as a default search option (joining Google and Yahoo), and expected security patches. But the biggest change, at least for those who like to customize their browsers, includes new support for building and installing browser extensions, à la Firefox's add-ons. Developers can currently hop onto Apple's Safari Developer program to start writing (or converting) add-ons that might block ads, synchronize bookmarks or store passwords. You can already pick up early versions of some add-ons, such as the estimable Lastpass, but getting them into Safari 5 will require some quick manual steps to enable extensions. Expect Apple to open the doors to a Safari Extension collection in the coming months. If you're on the hunt for an alternate browser, you've got nothing to lose by giving Safari 5 a try. For my own browsing, I'm currently bouncing between Chrome and Firefox (with passwords and bookmarks sync'd between the two, courtesy of Xmarks and Lastpass), and Safari doesn't offer anything to pull me away from either browser.